Goldfish bowls are a staple at department stores as well as most pet shops. Ask anyone who had a goldfish as a kid and odds are they kept it in a goldfish bowl. Google for Goldfish bowl photos or Goldfish bowl shopping, and you’ll find thousands of them in a variety of shapes. Obviously Goldfish bowls must be the ideal home for a goldfish, right? Wrong. Goldfish bowls are far too small for even a single Goldfish. 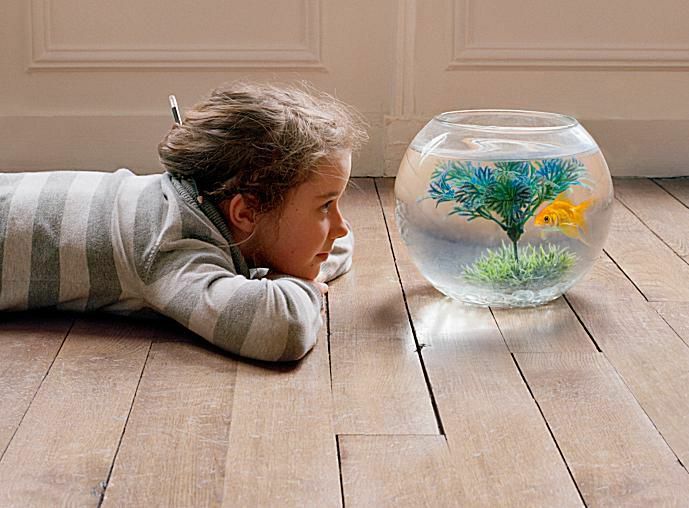 Although the Goldfish you buy at the store looks small, it's only a matter of time before it outgrows the Goldfish bowl. If properly cared for even a small Goldfish can easily grow to a half foot in length, and many will grow larger than that. Furthermore, Goldfish bowls are too small to accommodate a filtration system, or equipment to circulate and aerate the water. As a result, the water will quickly become depleted of oxygen, and build up toxins that are dangerous to the fish. With such a small quantity of water, it doesn't take long to hit the danger zone. Goldfish are robust fish that produce more waste than similarly sized fish, which presents a huge challenge in a Goldfish bowl. With no filter or stable beneficial bacterial colonies, the only way to remove waste and its by-products is to constantly change the water. And I do mean constantly, not just now and then. Although water changes are good, performing them daily is stressful for the fish. Most owners tire of the constant work and tend to go longer and longer between water changes. If the fish appears healthy, the owner may let water changes slide for weeks or months. Under such circumstances it is likely the fish will soon die from ammonia or nitrite poisoning. Even if the fish doesn’t die, it will become more susceptible to disease. No Goldfish kept in a Goldfish bowl lives as long and healthy life as one kept in the properly sized and equipped tank. Some tough Goldfish may survive in such circumstances for a few years, but that is far from a normal lifespan for a Goldfish. Goldfish should be kept in a tank that is equipped with a filter. The tank should be large enough to accommodate an adult Goldfish which can be anywhere from a half a foot to well over a foot in length. Steer clear of mini aquariums, even if they show a photo of Goldfish on the front. That photo is simply marketing, and not a true endorsement of the tank. The smallest size tank to consider for a Goldfish is twenty gallons. If you want to keep several, you’ll need a larger tank. Filtration is a must, and should be rated at a minimum of four times the tank size in gallons, per hour. For example, a twenty gallon tank should have a filter with a minimum capacity of 80 gallons per hour (gph). In this case more is better, so don’t hesitate to get a more powerful filter. A heater is not needed, as Goldfish prefer cooler water. However, it’s wise to equip the tank with a thermometer so you can monitor the temperature. As water temperature rises, the amount of dissolved oxygen drops, which can prove harmful, or lethal, to your Goldfish. Live plants help remove wastes, so if possible, decorate your tank with live plants rather than using artificial plants. With a proper size tank, good filtration and care, your Goldfish can live for decades. Do them a favor and just so no to the Goldfish bowl.